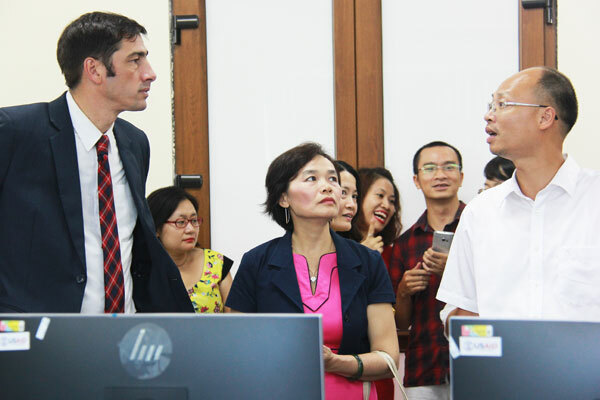 The USAID-funded new building energy simulation lab opened at Vietnam’s Ministry of Construction on September 12, 2017 in Hanoi. The lab is part of the USAID Vietnam Clean Energy Program’s sustainability plan to ensure that key program components and activities continue to benefit the Ministry of Construction with the necessary software and tools. 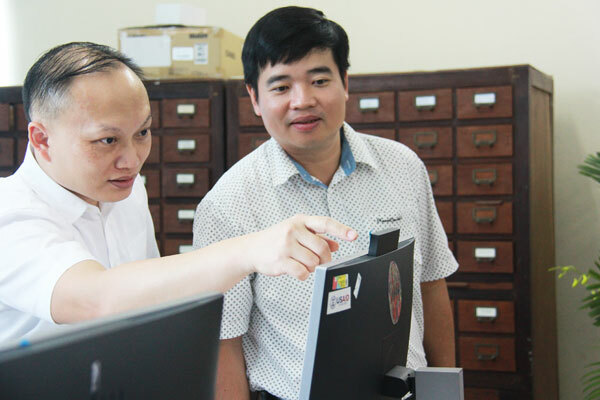 Nguyen Ngoc Quang, director of the Information Center at the Ministry of Construction, with Nguyen Cong Thinh, deputy director of the Science, Technology and Environment Department of the Ministry of Construction. The lab can accommodate up to 10 students and will continue to collect, analyze and maintain quantitative models and data for socioeconomic energy research, anlysis and policy making. It will also provide a shared resource and knowledge platform to train the Ministry’s staff and other training instututes and univerisities on how to incorporate building energy efficiency simulation into their building designs. Christopher Abrams, director of USAID Vietnam’s Environment and Social Development Office (above left); Vu Thi Kim Thoa, the Vietnam Clean Energy Program’s chief of party (above center); and Le Trung Thanh, director of the Vietnam Ministry of Construction’s Science, Technology and Environment Department (above right), and other representatives of the ministry’s related agencies, USAID Vietnam, Winrock International and the USAID Vietnam Clean Energy Program attended the dedication ceremony.